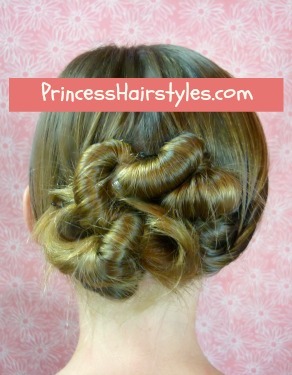 Up do styles such as this can be worn as casual / every day looks for school and work. 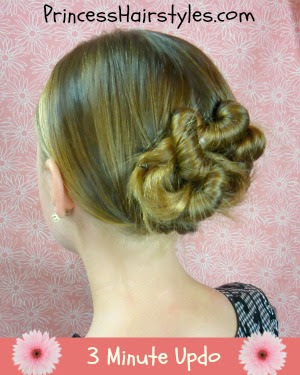 Or, for elegant and special occasions such as a formal dance (Prom, Homecoming) church, wedding (a bridal hairstyle) etc. You could even add some little flowers, clips, jewels or other "bling" around the twists to make a more fancy hairdo if you desire. Super cute! Can't wait until my daughter has enough hair for this one! that's fabulous! I really like the pink background in this video, the green was a bit too bright. My daughter's hair isn't quite long enough for this, but we managed to put the front up like this! It's really cute on her, too! A very nice and easy to follow video tutorial. I may have to give this one a go one day! That hair is cute. Im going to try it out for me Valentines Dance. I really love this style! I have poofy, ultra thick hair that goes with any style. I absolutely love wearing my hair like this! I think it looks sloppy. From the photo, it looks so complicated. I have no idea how it is so simple to do. It looks elegant in a bit messy way. Great site!